A 17-year-old white female presented to the emergency department with chest pain 12 h after ingesting four pills of phentermine (Adipex®). She complained of retrosternal chest pain radiating into her neck with inspiration. Medical history was unremarkable, and she denied any other medications or illicit drug use. Vital signs were normal with 100% pulse oximetry. Physical examination revealed normal heart sounds, no adventitious breath sounds, and no palpable crepitus. 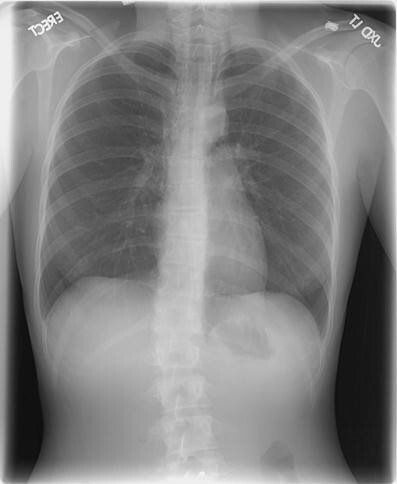 The initial PA and lateral chest X-rays are shown. The X-rays demonstrate pneumomediastinum with evidence of extension into the cervical fascia proximally and around the esophagus distally. The lateral chest X-ray reveals a moderate amount of air in the anterior mediastinum. There was no history of pneumothorax or retching, and her urine toxicology screen was negative for any drugs of abuse. Esophagram, chest computed tomography, and esophagogastroduodenoscopy revealed no source of her pneumomediastinum. The patient’s hospital course was uncomplicated, and she was discharged 48 h later. 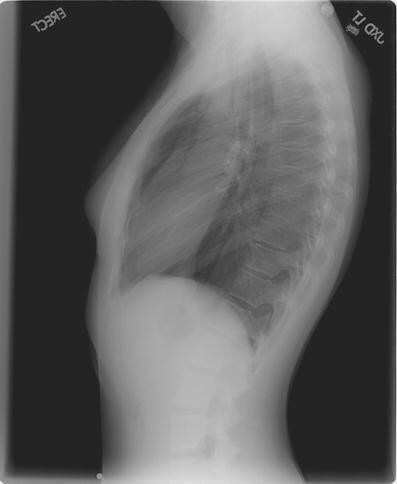 Pneumomediastinum can occur spontaneously or in the setting of trauma. Spontaneous pneumomediastinum is a rare condition, with some reports occurring as infrequently as 1 in 30,000 (general population)  to 1 in 42,000 (pediatric population) . Phentermine use has been associated with severe lung injury and pulmonary hypertension , but to our knowledge no cases of pneumomediastinum after oral ingestion have been reported. Inhalational drug use of amphetamines, however, has been linked to pneumomediastinum . A conservative treatment approach is appropriate for spontaneous pneumomediastinum without evidence of cardiorespiratory compromise . Underlying conditions must be ruled out, such as Boerhaave’s syndrome, because significant morbidity and mortality are associated with such disease states. The prognosis of spontaneous pneumomediastinum is invariably benign, with adverse outcomes attributable to the precipitating cause.